Just locating grouper, cobia, snapper, sharks and other reef and bottom fish can be a challenge. Getting them to bite even more challenging. Why not give yourself a leg up with these innovative fish attractants from Voodoo Offshore? Menhaden Milk® was created specifically to be a super effective fish attractant and it was better than anyone expected. Tournament Master® Chum combines highest quality menhaden chum blended with Menhaden Milk® to possibly be the most effective chum on the water. Voodoo Oil is a more traditional product for use where oils are needed. Be sure to visit our Tips and Tricks page to see innovative ways to use these products. 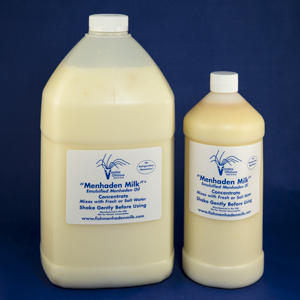 Soak your baits in Menhaden Milk® for a few hours or overnight. Your baits will trail a strong fish attractant that will bring the big ones in. Use it with your Sabiki rigs to catch your bait faster too. Tournment Master® Chum is the best selling chum in the US. The reason why? It’s super effective. The combination of best quality menhaden and Menhaden Milk® is unrivaled. Voodoo Oil is for more traditional applications where you want the oil to float at the surface or you want the option to combine a highly attractive, more bouyant scent into your own chumming mix.